Ka Prao literally means the Holy Basil in Thai. It is an erect, many branched subshrub with hairy stems and somewhat crinkled green or purple leaves that are strongly scented, it is spicier in taste compared to the common Thai basil that many Thai dishes used. Since Ka Prao is hard to come by in the Asian supermarkets here, many restaurants opted for the common Thai basil for this dish, though it is fine in the taste, it is technically no longer a "Ka Prao" in my opinion as the green leaves uses is not Ka Prao. I had to grow my own Holy basil this year since I really missed the real Ka Prao that I had in Thailand. 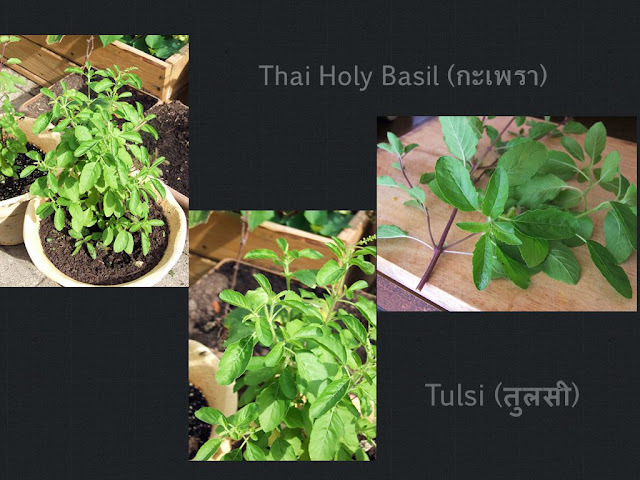 I bought two Tulsi/Tulasi plants in the earlier months from the Indian supermarket, as I figured that they are nothing but Ka Prao/Holy Basil not long ago! The plants are doing very well and yield good leaves which allowed me to make my favorite Kra Pao dish several times already. 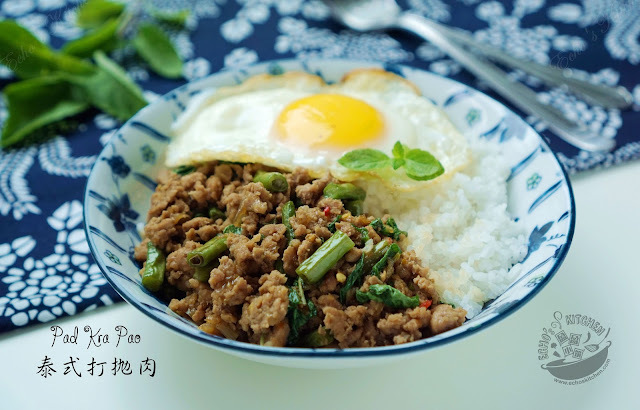 I had made Ka Prao using minced Chicken, Turkey and Pork, all turned out very nice and tasty. I may even try fish soon if the plants able to give me another batch of harvest before winter! 1. Peeled garlic and remove stem from Thai chilies, pound both in a mortar and pestle until it is well crushed. 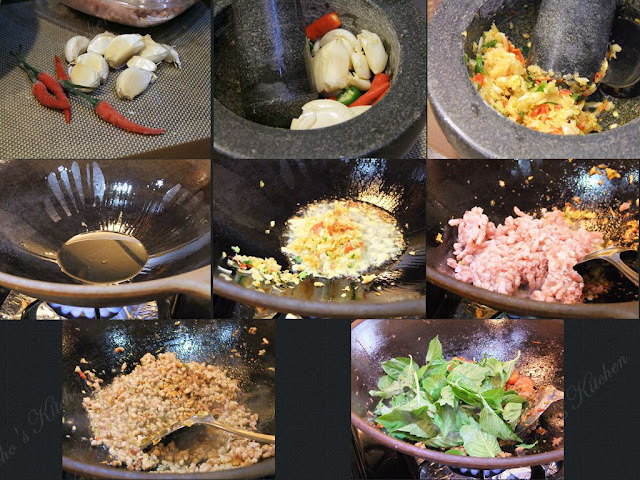 Note: You can also minced the garlic and chilies on a chopping board, many swear by the difference in taste by pounding the ingredients, which I had come to appreciate very recently. 2. Heat up 2-3 tbsp of oil in a wok/cooking pan, cook the pounded Chilies and garlic until fragrant. 3. Add the ground meat and keep stirring to break the meat as much as possible. Season with fish sauce, soy sauce and sweet soy sauce. Continue cooking for few more minutes until the meat is fully cooked. 4. Add holy basil leaves before turning the stove off, stir until the meat and leaves are well mixed and leaves started wilting.